After a first Season that filled the anime community hearts full of love (Best anime ever!) and then hatred (Loopholes everywhere and everything was horrible), A-1 Pictures decided to give it another shot, that could put Sword Art Online (SAO) as one of the greatest anime ever or as a mediocre one! Before watching this anime, I recommend you to watch SAO (first season) first, but if you want, SAO2 is watchable (not fully understandable) without previous knowledge of the past events. It’s worth talking about the previous season due the controversy that it generated (do not read this if you didn't watch the first season). I never saw an anime pass from total devotion (and see all anime fans loving it), to total hate (looking for loopholes and failures), like in SAO. Doing the obvious math, this resulted in two arcs. In the first arc we assist to a lone player Kirito, fighting for his life during two years in an online world where you can’t logout, and if you die in the game you die in real life. In the second arc we assist to a complete "train wreck" of the all mighty Kirito to save his girlfriend Asuna. Obviously, I did not like the ALO world. The plot was too weak, with a horrible pacing and the new character styling (from sword warriors, to fairies) don’t convinced me. But I don’t started to hate SAO, in first part there are still 12 good episodes (epic ones), where SAO's season should have ended. 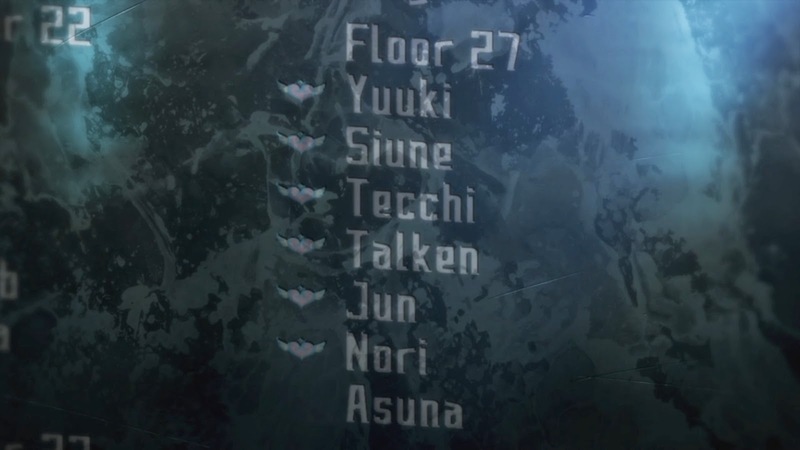 SAO managed to establish a new genre (the "trap in game" genre) and established a high standard, standard that failed to keep in the second part of the season. 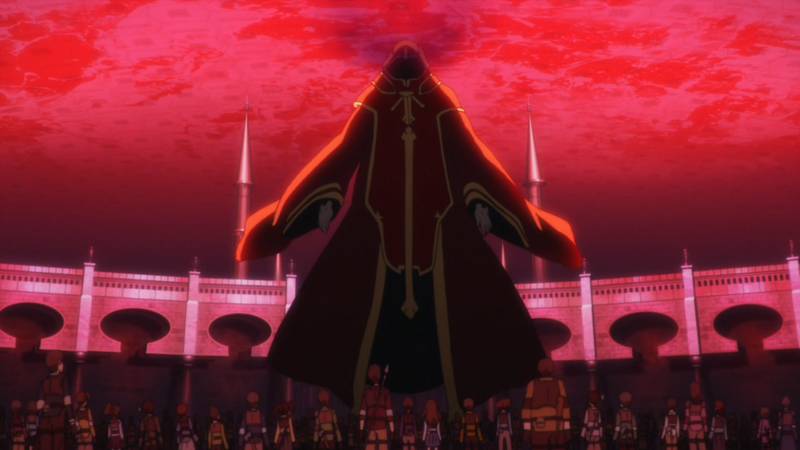 But it ended with hope that SAO's world would return, in an update to ALO's world with the appearance of Aincrad, the castle of 100 levels where they were trapped in the very first part of the anime! So, naturally, when I saw the picture bellow in my Network(Google +, Facebook), immediately I established high hopes for the second season of SAO and sincerely hoped that they (A1-Pictures) had corrected their mistakes! Generally I only think about the art and the song of the opening and generally I don’t like changes in the openings of past anime's seasons, especially if I enjoy them, but they already destroyed this in the second part of the first season! I saw guns and bullets be fired, where was my Aincrad castle? 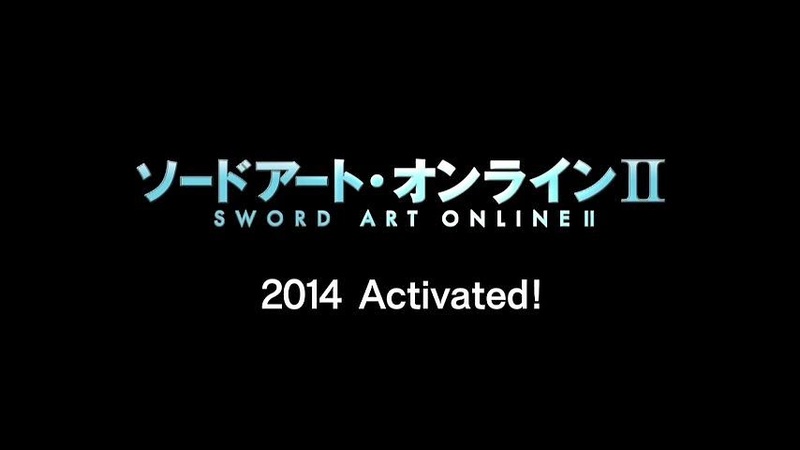 This was the confirmation that in the second season of SAO they were going build a new world with a new system/ rules! But lets explore that later. This is the soundtrack section and this opening does its job, giving me a trailer of what SAO II was going to be, with an average song ("IGNITE" by EirAoi) and decent animation at least they improve the opening (comparing with SAO I - second part)! I put my expectations in this anime very high, because I really wanted they had managed to make everyone forget the crappy 2nd arc of the SAO I, by producing a great anime for us! So the first couple of episodes were a series of expectations and disappointment! 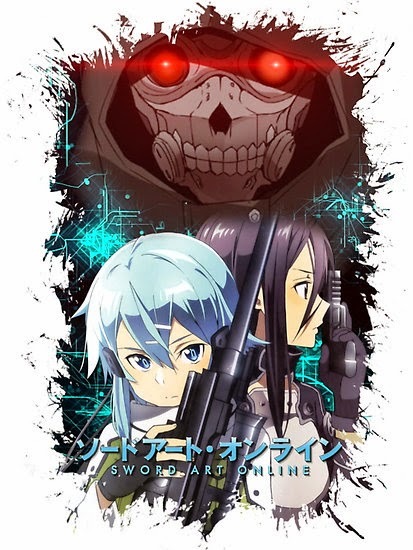 Sword Art Online II starts presenting to us the world of Gun Gale Online (GGO), and I thought this anime would be with new characters, only with some spontaneous appearances of Kirito’s gang! 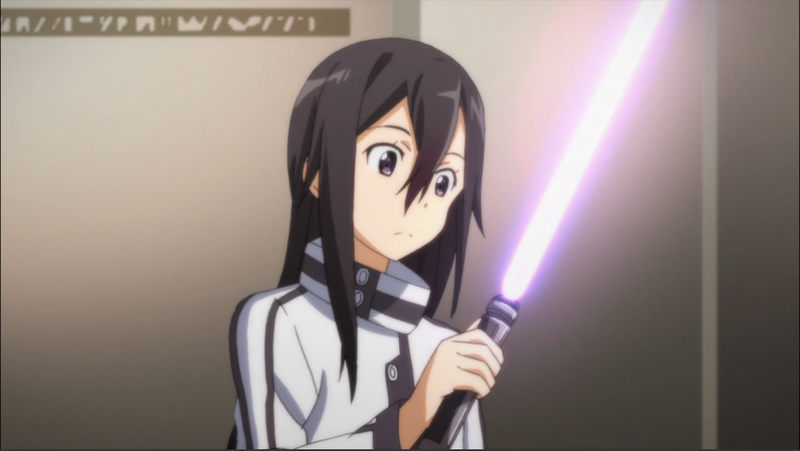 But then I realize that I was completely wrong, when I saw that Kirito would be the main star once again! Then I thought: "well, it’s Kirito's first time in GGO, at least we will see a character evolution from the scratch". So, after this start, did SAO 2 something right? This answer will depend of your personal taste. SAO 2 didn’t bring anything innovative this time, but it uses some cards that fulfill my tastes in an anime. The more important it's the GGO event, the Bullet of Bullets (BoB), that it’s a tournament all against all, and without exception in every anime, movie, book, etc. that I watched that had tournaments, I enjoyed. 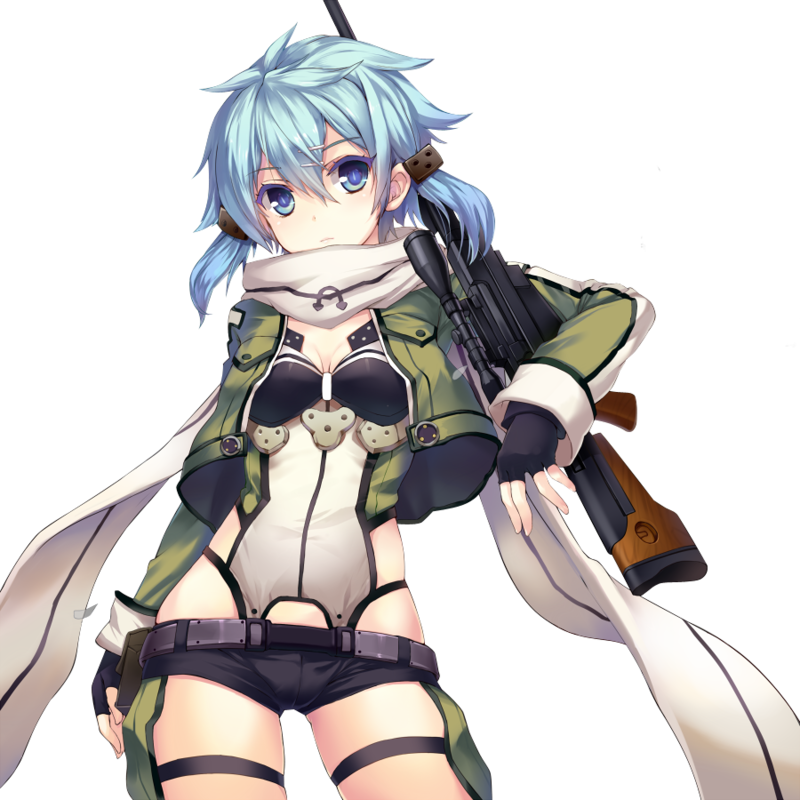 They make an excellent work with Sinon “the sniper”, I think it’s a very interesting female character from the design to the back story! And to end and to give some kind of compliment to character of Kirito , I enjoyed Kirito's avatar, for not being a reflection of himself (although it was not intentional).Because in a personal note I hate what the web is becoming where is an extension of us instead of be what we want to be! The plot (it’s an important part of any anime or other storyteller media) it was interesting, but SAO 2 - GGO arc didn’t focused in the game aspect. 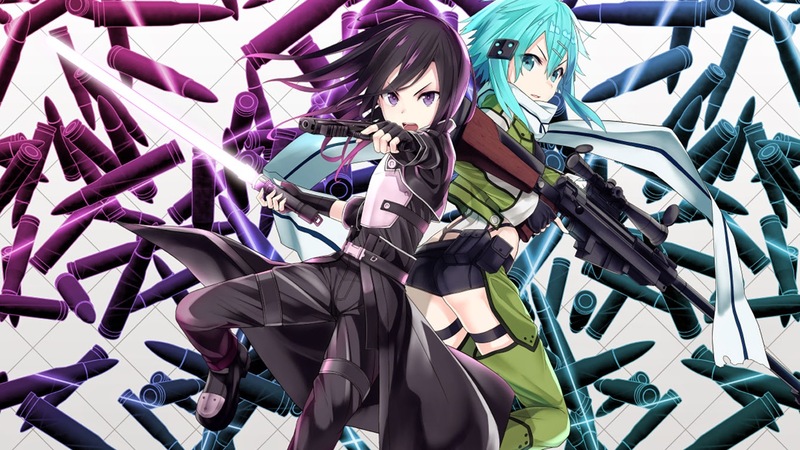 We don’t see the GGO world be explored, we don’t know his mechanics, we don’t know anything, with exception of there are a tournament where Kirito (the 5 seconds GGO's expert), will try to capture a character called by the name of “Death Gun”. Because every time that we fired his gun, a player disconnects and dies in the real world, and the “cyber police” had to send the expert Kirito to investigate! In general I liked this arc, Shion's story, her interaction with Kirito and the fight against “Death Gun”, unfortunately with the plot being unveiled, it transformed the game anime in a detective story! If you noticed, I started to talk in GGO arc, my biggest fear comes true and in the half season, like in SAO season 1, the recipe would be the same: that season it also receive another part and, like in season I, the pacing of this transition was awful. So what did they done? First they return to the awful world of ALO, and once again (like with Asuna) they transformed a good female character (Shinon) in one more girl in love with Kirito, with a bow and animal ears (simply awful, it’s like to see Vegeta been transformed in Krillin [Dragon Ball]). In the Quest's arc, like I said before, it was Shinon's integration in the SAO group, transforming/ destroying completely the character, losing all the glory/ interest during the arc! They also were humiliated by Log Horizon (an anime that had to work hard to lose the connotation of "SAO's copy"). In Log Horizon they show the mechanics of the game and they explained everything that is needed to a viewer understand the plot. The quest of SAO 2 it’s a total chaos, they don’t explain anything, you’re going to stay lost the entire quest, trying to understand concepts that weren’t explained! There are not much to talk about in this arc, in an OVA it could be interesting but, in this case, it was totally out of context only to make the transition from the Gun Gale Online to the Alfheim Online World. 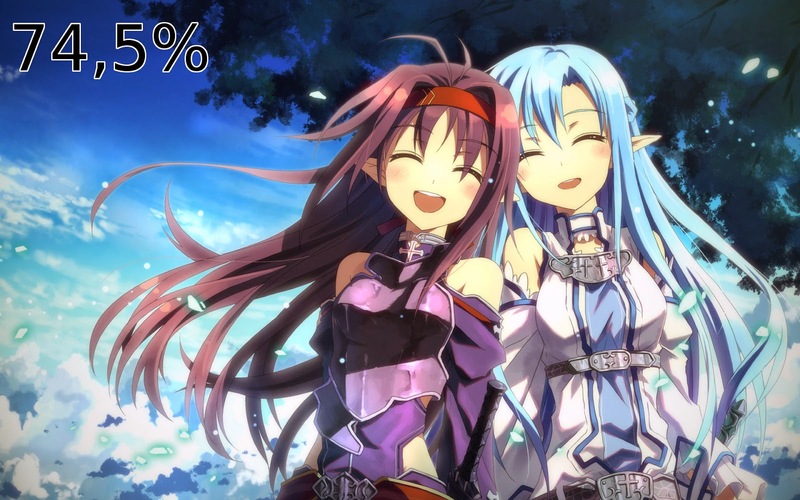 And after an awful transition it starts an interesting arc in SAO: the Sleeping Knights Arc! (After the disappointing train wrecking that was the first arc). And why it is interesting?? Because Kirito finally stepped out and we are able to see shades of the original Asuna in a ALO/Real World context and a new interesting player appeared in the game. o the awful world of ALO, and once again (like with Asuna) they transformed a good female character (Shinon) in one more girl in love with Kirito, with a bow and animal ears (simply awful, it’s like to see Vegeta been transformed in Krillin [Dragon Ball]). This arc explained some of the difficulties that SAO survivors are passing, after all they suffer a 2 year gap. 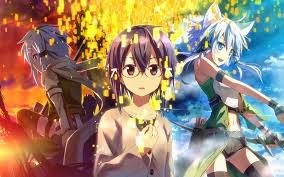 It also introduce Konno Yuuki, the leader of a guild constituted by a group of players that are suffering from a terminal disease and are playing the game to experiment innovative technologies/treatments. The guild's objective is only one: engrave their names in ALO, to symbolize their existence by beat a boss (Aincrad World yeee). To help in that quest they chose Asuna, after some trials to do this achievement. This arc is simply the better and sadder arc of SAO 2, remembering all of us if you die in reality, you will die in the game :P! Sword Art Online II in an overall note, in terms of expectations was a disappointment; I was expecting other angles of the story, mostly of the questions left open of the first season stayed unanswered. If SAO (2010) didn’t exist I probably had given a bigger score, for me SAO failed to put their product as one of the best anime series of all time! The ending of the second season gives space to a third season, and finally they say the name of SAO's creator (Akihiko Kayaba). There is still hope, but now with less expectations. Like I said before, the end of second season was weak and leave the feeling of a third season. Checking the manga there are still stories being written, so one day in the future SAO 3 will be activated!